Chris and Tara have a way of adopting people, and making them feel warm and welcome. They certainly made me feel that way. They included me on their wedding signage, got me a corsage, and invited me to stay on for their wedding reception. 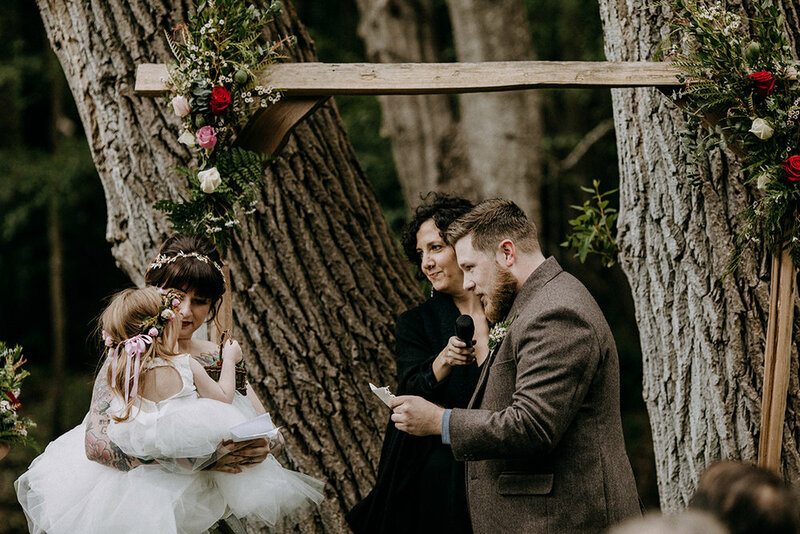 Early on in their ceremony, which took place at the Big Sur River Inn, I invited everyone to greet each other with a hug, hand shake or high five so that everyone could feel cohesive and connected as a community. Old friends reunited, new connections were established, and an environment of inclusivity and camaraderie was instantly created. I later told their particular hero/heroine journey, from how they met, got pregnant, had a baby, broke up, and got back together. I also shared about the loving, affectionate, respectful, and laughter-filled home they'd since created together. Photos by Maria Newman Photography.